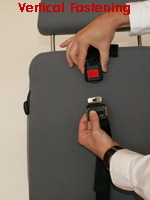 The Easy Travel Magnet Belt is designed to offer maximum safety by making it virtually impossible for the user to open. A special magnetic key releases the buttons when required by the carer. 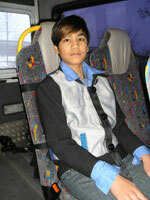 It is worn like a waistcoat, with a padded crotch strap to prevent users sliding out of the bottom. The buttons on the front can only be opened with the use of a magnet, preventing even the most high functioning person from ‘escaping’. They are comfortable to wear, and do not have the appearance of a harness. 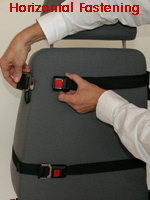 Easy to fit, with either one vertical or two horizontal straps which fasten at the rear of the seat. The Easy Travel Magnet Belt is quickly moved between vehicles as no other fixings are required. There are five sizes available, covering from ages 2 1/2 years up to adult, and all materials are designed to take a 600kg loading. The vehicle seat belt is then used in front of the child to provide safety in the event of a crash. A ‘lift the dot’ version is also available for those children who do not need the Magnetic Key. In using either the Unisafety Harness or Buckle / Angel Guards, there is an added risk, that in the case of a vehicle accident, those assisting in any rescue may not know how to release the harness / guards. To this end we recommend that a seat belt cutter is always carried in the vehicle, and the provided sticker is placed in the vehicles’ window.